This is where you can visualize and edit the contents of the currently selected design. 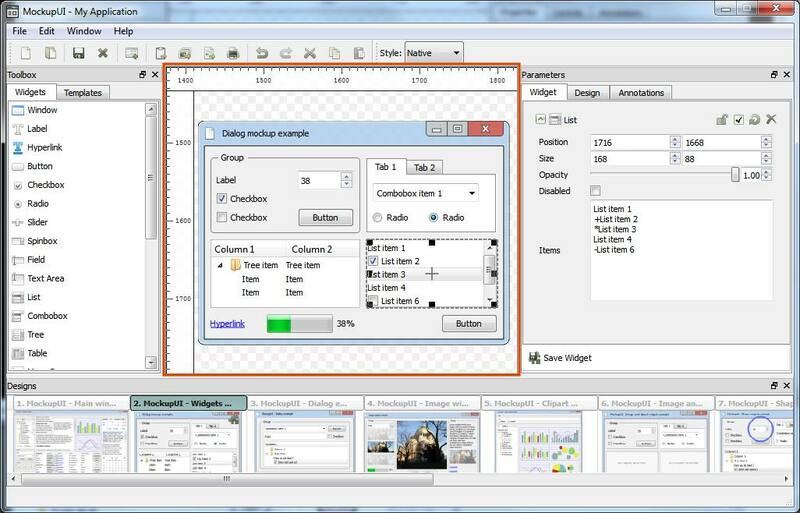 It is also where you can insert, visualize and edit widgets. If the design does not fit into the Viewer window you can scroll the view to see a different part of it. Hold down the Ctrl key and the Right Mouse Button and drag the image by moving the mouse. Once a widget is added to a design, it becomes visible in the design area inside a rectangular box that can be moved or resized to the desired dimensions. The content of the widget will be updated when the widget properties are changed. Selecting. Press the Mouse Left Button inside the widget's bounding box to select it. A selected widget will display a rectangular box around it. Moving. Hold the Mouse Left Button inside the widget and move it to the desired position. The position of a widget is relative to the center of the widget and to the top-left corner of the canvas. You can use the horizontal and vertical ruler as a guide. Resizing. Hold Mouse Left Button over a border and drag it to resize the widget. When the mouse hovers over the borders or the corners of a widget you will notice that the mouse pointer changes into an arrow. This tells you that a resize action is available. Dragging a border will resize one dimension of the widget while dragging the corner will change the height and width of the widget. If you wish to preserve the current aspect ratio of the widget, hold the Ctrl key while dragging. For image widgets, the content of the image can also be edited. The image can be scaled, rotated and translated. Note that transforming the content of an image widget refers to the image and not the widget's sizing box. If you want to change the dimensions of the widgets use the Size parameter. Scaling. Hold Shift + Mouse Wheel. Scales the image up or down (from 0 to 10 times). Rotating. Hold Shift + Ctrl + Mouse Wheel. Changes the angle of rotation around the center of the image. Panning. Hold Shift + Mouse Move. Offsets the image horizontaly and verticaly from the center of the widget. Show/Hide. Hiding a widget will remove it from the design area. If you want to make it visible it you will have to do this from the Design panel. Reset to Default. This action will reset the widget's parameters (such as size and position) to their initial values. Lock. This action will make the widget unselectable and non-editable in the viewer. Cut Ctrl+X. Remove the widget from the image and put it onto the clipboard. Copy Ctrl+C. Put a copy of the widget onto the clipboard. The copy will preserve all the parameter values of the original. Paste Ctrl+V. Paste the widget found on the clipboard into the currently selected image. The pasted widget will have the same position and dimensions as the original. Duplicate Ctrl+D. Create a copy of the widget and paste it into the currently selected image. Rename F2. Change the name of the widget. Delete Del. Remove a widget from the design. Ordering. Widgets are rendered in the order they have been added, meaning that the last added will overlap the previous. The order can be changed by using the Bring to Front (PageUp key) or Send to Back (PageDown key) on the selected widget. You can also change the order of the widgets by dragging the effect up or down inside the Design tab in the Parameters panel.